What an amazing color! I saw this yarn in a thrift store and fell in love... I know yellow is not for everyone, but if it's your color, go all the way! Go bright! 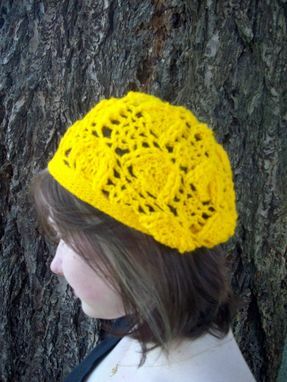 Slouchy tam-style hats are very flattering. I call this hat the trilobite tam, because the pattern reminds me of those ancient fossilized crustaceans. 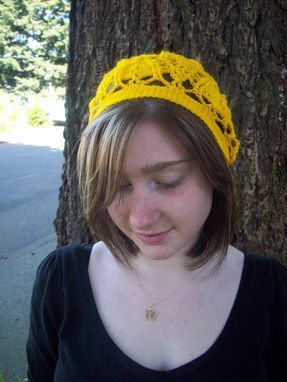 This one is made of bright, bold yellow acrylic yarn, a cure for the winter blues. The lightweight yarn has a fine texture and adds to the dainty look of the hat. The brim is stretchy and will fit just about anyone. The full crown is perfect for tucking up your hair. 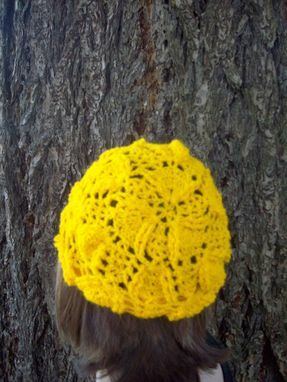 The light crochet pattern makes this an all-season hat. Wear it in winter to keep your hair neat under your layers, and during the rest of the year as a versatile accessory.